Delight in beachfront Shipwatch Surf and Yacht Club, for beaching, boating, for pure enjoyment. This unique property is located on 500 feet of beachfront and also offers old river access across the street. 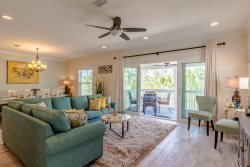 These spacious condos boast a Southern Living, cottage atmosphere with large beachfront balconies from your Living Room and Master Bedroom. Two bedrooms, two bath and three bedrooms, two bath units are available. The complex has two outdoor pools, lighted tennis courts, fitness center, sauna, indoor hot tub, grilling areas, boat docks and boat launch.